This column was written by Arthur C. Brooks. For weeks, French university students rioted over a set of labor law changes that were to make it legally possible to fire some workers under the age of 26. Nearly one in four young French workers cannot currently find any job — and the government understood that lowering the risk in hiring untested, younger employees would result in more being hired in the first place. Far from celebrating this reform, French students reacted by attacking police, destroying storefronts, and burning cars. 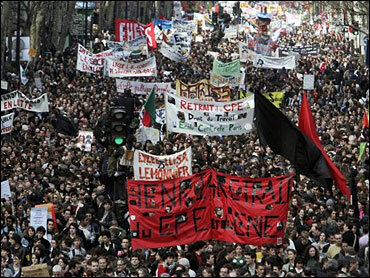 The demonstrations metastasized into a general strike, which predictably, became a platform for catch-all left-wing protests against capitalism, America, and the Iraq war. Like most American economists, my schadenfreude-soaked analysis of the situation was that French policymakers were simply reaping what they have long sown with their noxious brew of heavy-handed economic dirigisme and nanny-state social policy. A friend of mine explained it in a different way, with recourse to an old saying: Anyone who is not a socialist before age 30 has no heart, while anyone who is still a socialist after 30 has no head. In other words, the anti-capitalist slogans and Molotov cocktails were little more than youthful exuberance — an excess of "heart" over "head." This explanation is a common way to excuse leftist excesses of youth, not just in France but everywhere. Before accepting it wholesale, however, a glance at the evidence is in order. Do young leftists exhibit any more heart than young right-wingers? There is almost no data from France to test this question, but plenty of evidence to examine it in the United States. And it leads to a surprising conclusion: In most ways, the old saying is quite wrong. This pattern persists at the community level. Young liberals in 2004 belonged to one-third fewer organizations in their communities than young conservatives. In 2002, they were 12 percent less likely to give money to charities, and one-third less likely to give blood. These differences were not due to demographics such as age or education. Imagine that you picked two people, both under 30, from the American population. Imagine they had the same education level, same household income, and were of the same race and gender. The only difference was that one was a self-described liberal, and the other a conservative. Based on nationwide data collected in the year 2000, the young conservative would donate nearly $400 more per year to charity than the young liberal. Of course, there are many other ways to measure heart, some of which probably favor young liberals over conservatives. But the evidence here suggests that leftist youth don't have any clear cardiogenic surplus after all. They do, however, appear to possess something of an advantage when it comes to the head — or at least to education. In 2000, a young liberal was much more likely than a young conservative to possess a college or graduate degree, even after correcting for all other relevant demographic forces. Taken all together, this suggests that the old saying about heads and hearts is actually backwards, when it comes to youth on the modern American left. One might argue that these findings are somehow inapplicable to France — that the young French left is, for some reason, more soft-hearted than young American liberals. I can think of no obvious reason why this would be the case, however. Assuming these American patterns also hold in France, it suggests a different interpretation of the French student riots than the one my friend suggested: They are actually a lot of head, tarted up to look like heart. In fact, the rioters got exactly what they wanted in the end. President Jacques Chirac yielded by nullifying the main parts of the law and granting these young university-educated Frenchmen the job security they demanded. The cost to France will be even more increases in youth unemployment — but not for these students. The unemployed will come disproportionately from the less-educated and less-fortunate groups in French society, such as the idle and alienated Muslim youths who rioted last fall (more than half of whom are currently unemployed). These protests, therefore, boiled down to a simple, successful attempt by elites to secure benefits at the direct cost to another, less-powerful group. So much for the old saying. The problem with these riots was not an overabundance of heart — it was a lack thereof. Arthur C. Mr. Brooks is a professor of public administration at Syracuse University's Maxwell School of Public Affairs. His latest book, entitled "Who Cares: The Surprising Truth about Who Is Charitable, Who Isn't, and Why it Matters for America," will be released in the fall by Basic Books.